"If you cannot measure it, you cannot improve it." That was a quote by Sir William Thompson, Lord Kelvin (1824-1907). Much has been said about providing information and transparency to consumers of commodities. This rings especially true for electricity in today’s markets. The National Information Solutions Cooperative® (NISC) announced to its member utilities recently that it has signed a channel partnership with Google (NASD: GOOG) to provide energy information to end consumers. The announcement, made at the annual NISC member information conference, signaled Google’s move into the nation’s largest group of cooperative utilities and public power entities to date. Previously, Google had signed partnerships with individual utilities such as JEA, SDG&E, Toronto Hydro, TXU Energy, White River Valley Electric Cooperative, and Wisconsin Public Service. The purpose of the Google move into energy is to educate consumers on their energy usage. Per the Google website, Google PowerMeter is a free electricity usage monitoring tool that provides consumers with information on how much energy the home is consuming. 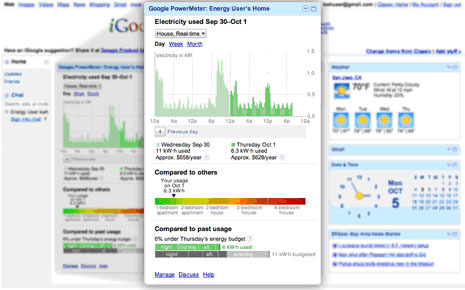 Google PowerMeter receives information from utility smart meters and in-home energy management devices and visualizes this information for consumers on iGoogle (a personalized Google homepage). PowerMeter is a product of Google.org, the non-profit philanthropic arm of Google, which aspires to leverage the power of information and technology to address global challenges. NISC was formed July 2000 as a consolidation of Central Area Data Processing Cooperative (CADPC) and North Central Data Cooperative (NCDC). Both predecessor organizations were formed in the mid 1960’s and had a rich history of serving energy and telecommunications cooperatives with information processing services and accounting and billing software. NISC has more than 510 energy and telecommunications members in 47 states, American Samoa, and Canada. It bills more than 7.2 million end user subscribers/meters. The first NISC member to sign up for the Google PowerMeter is Minnesota Valley Electric Cooperative (MVEC). Located on the southwest side of Minneapolis, MVEC serves 33,000 electric consumers with approximately 40,000 meters. The consumer mix is 70% residential and 30% commercial. Most of the meters are Landis & Gyr while the advanced metering infrastructure (AMI) network technology is provided by Aclara (a little over 25,000 meters have been converted with an Aclara module inside). MVEC is going to be utilizing a newly developed meter data management (MDM) application provided by the NISC. This is where Google will get its data for the PowerMeter. Consumers will sign up for the service via MVEC’s e-bill site. There they will give consent for MVEC to send their usage data to Google. The consumer may then access a personalized igoogle page to view their energy consumption. The goal of both the NISC and of Google.org is to simply educate energy consumers on what they are using and the impact of specific devices in the home on energy usage. Education can modify behaviors and increase energy efficiency awareness among the public. Evidence of this can be seen with the advent of the digital dashboard on the Toyota Prius. Love them or hate them, Prius drivers have learned from real-time (or near real-time) feedback what the most efficient miles per gallon driving habits are. For instance, 38 miles per hour seems to be a more efficient speed than 35 or 40 miles per hour. If the public knows what its energy usage is in near real-time, then it can start to make decisions that are more informed and could encourage energy efficiency.